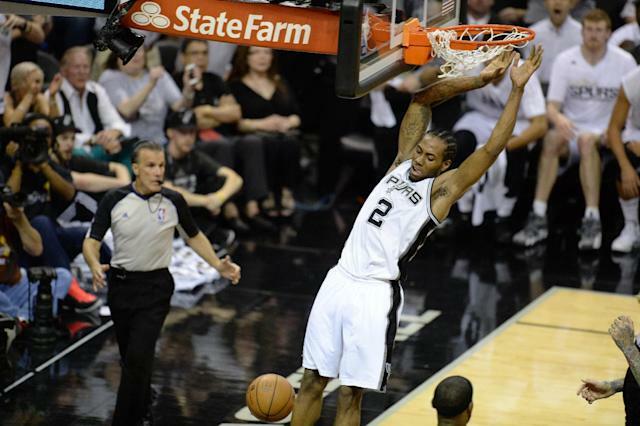 San Antonio (AFP) - NBA finals MVP Kawhi Leonard says he is withdrawing his name from the pool of players being considered for Team USA at the FIBA World Cup. Leonard, who led the San Antonio Spurs to the championship last month, told the San Antonio Express-News that he needs a break after the long regular season and playoff grind. "This was a very difficult decision," said Leonard, who advanced to back-to-back finals with the Spurs. "I want to go out and compete against the guys from these other countries but I need the time to heal and just rest my body from the long season." Leonard said he watched teammates Tony Parker and Manu Ginobili struggle the next season after competing in off-season tournaments. Parker played for the French national team at last summer's Eurobasket tournament. "I went through those two seasons going down to June 20," the 23-year-old Leonard said. "That's tough on your body to keep going. "I'm just learning from Tony and Manu (Ginobili), just going into that off-season and playing so hard and then coming back and their bodies not feeling the same and then being tired for the regular season. So I'm just learning from them." Leonard was considered a safe bet to make the USA men's basketball team. He will remain in the national player pool for the 2016 Olympic tournament. The FIBA World Cup will be take place August 30 to September 14 in Spain.